Dust off your bikes, mark your calendars and book your accommodations; the Agassiz Farms Cycle Tour returns July 20, 2019! Cycle the heart of the Fraser Valley! Tourism Harrison welcomes you to participate in the 13th annual Agassiz Farms Cycle Tour! Ticket Sales to be announced. 2019 farmers to be determined. The cycle tours are now on Facebook! Like us to follow the fun as we gear up for this year's event. Registration is now over for the 2018 Agassiz Farms Cycle Tour, but we look forward to having you back next July!! Tickets go on sale June 1st. 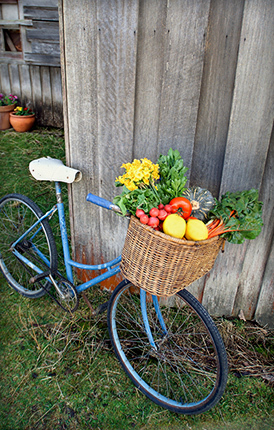 The leisurely self-guided Agassiz Farms Cycle Tour provides an educational and culinary experience exploring many farms; some that are open to the public for this day only! The tour gives a rare chance to meet the farmers and learn about agriculture, and pick up fresh produce in the spectacular Fraser Valley. The cycle tour is approximately 25km along flat public roadways. Start and finish your slow cycle any time between 9am-4pm. Please bring cash as most farmers are unable to accept credit cards. Volunteer for a few hours and join the cycle tour for free! It’s a wonderful way to support the event while still having time to take in the rest of the days activities and flavours. For more info. If you wish to become a sponsor or a partner with the Agassiz Farms Cycle Tour and show support through monetary or in-kind donations. Please contact Tourism Harrison Hot Springs at events@tourismharrison.com. Thank you for your consideration!